Bobby Pierce, Tanner English and Tyler Carpenter were all running nose to tail for the lead on the bottom of the race track. Just ahead, Gordy Gundaker, who spun out laps before while running in or near the top 5. Gordy was a fast car who happened to be at the tail of the field. It was going to be hard for the leaders to just drive him. 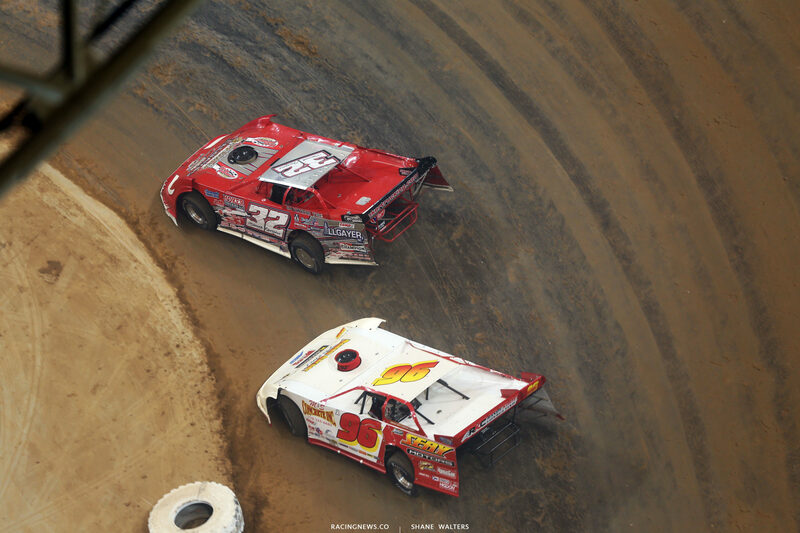 Bobby Pierce jumped to the top of the track to try and drive around Gundaker. At this point, the cushion was just about gone. But, it was too late for Pierce to move back down. Tanner English filled the hole and was on the back bumper of Gundaker. Lap 27, new leader, Tanner English. He led that lap by 5 feet. 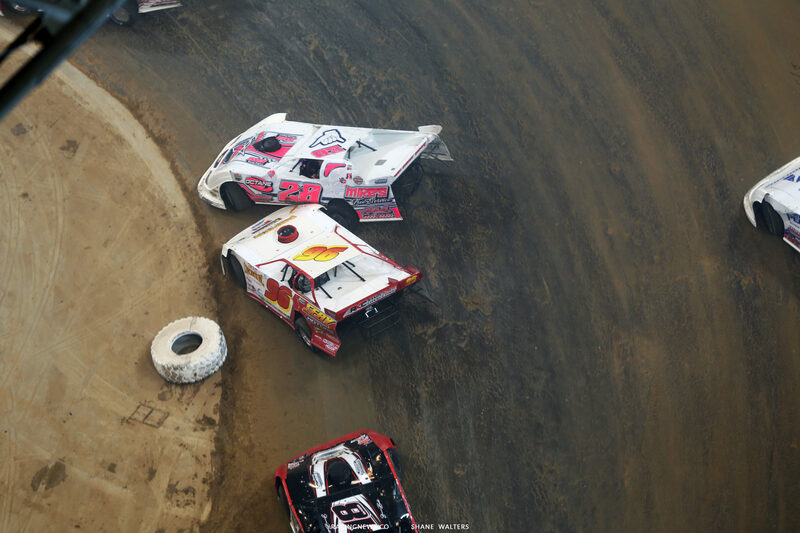 At this point, Bobby Pierce was in trouble as he was stuck at the top of the track with bumper to bumper traffic in the bottom lane. Lap 28, Tanner English was leading but he was still pinned behind Gundaker on the bottom. English and Gundaker have a bit of a history. Yet, Tanner never put the bumper to Gundaker. He may have even been a little cautious. Still Lap 28, English checked up for Gundaker in the middle of turns 3-4 to avoid contact. Tyler Carpenter then got into the back of English as a result. An accordion effect, it kicked English sideways. 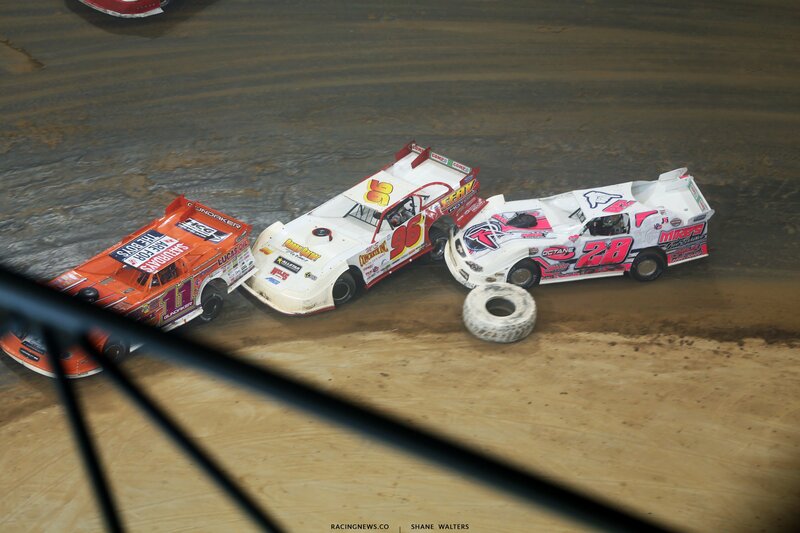 He slid up the banking and lifted due to the contact on his rear bumper. English lost 10+ feet to Pierce off the exit of that corner. 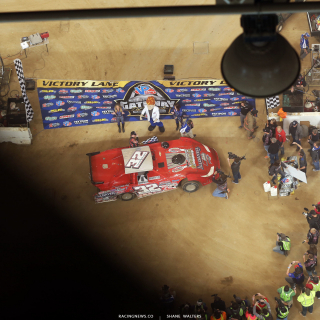 Bobby Pierce, from the top of the track, went back to the lead as a result. Lap 29, Brandon Sheppard was coasting around the track with a flat right rear. The caution was coming soon. English had gathered his car back up and retaken the lead. At the line on lap 29, English was the leader by a full car length. Just as English crossed the line, the caution came out. 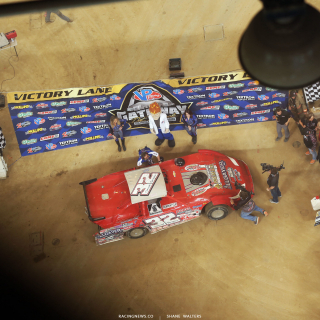 Bobby Pierce crossed the start finish line under the yellow. 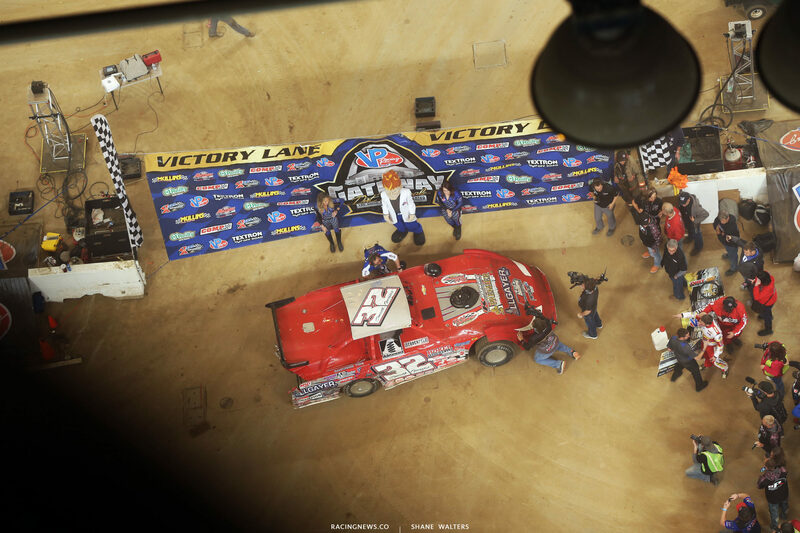 The Gateway Dirt Nationals has a leader +1 rule. That means if English and Pierce would have both crossed the line before the yellow, that lap would have counted as a completed lap. But, that didn’t happen, so officials reverted to lap 28. What happened after the caution? 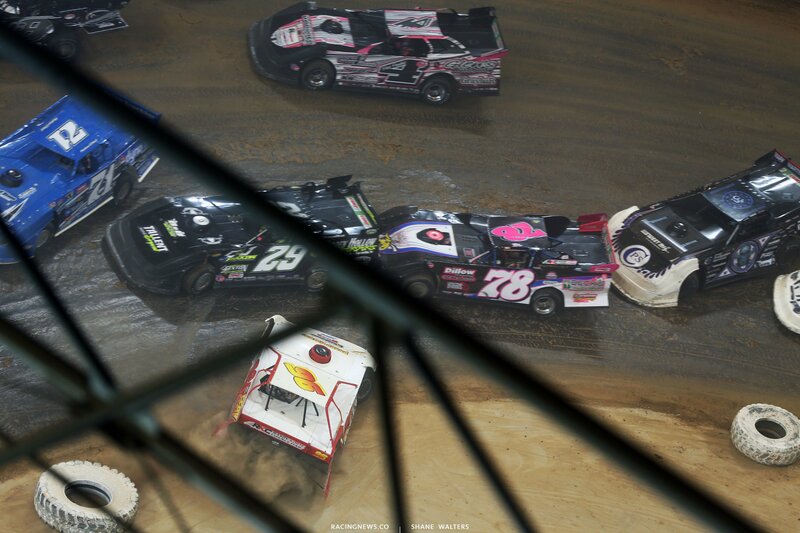 Officials put Bobby Pierce back into the lead for the restart. English would restart 2nd. As they went green, English tangled with Carpenter in turns 1-2. They again tangled in 3-4. This time they made enough contact to slow each other way down. They were still rolling, nobody spun, but they created a parking lot in front of the field. As they stacked up, Shannon Babb came into the scene with nowhere to go. Babb got into the back of English and sent him spinning into the infield. The caution came out and English was sent to the rear. 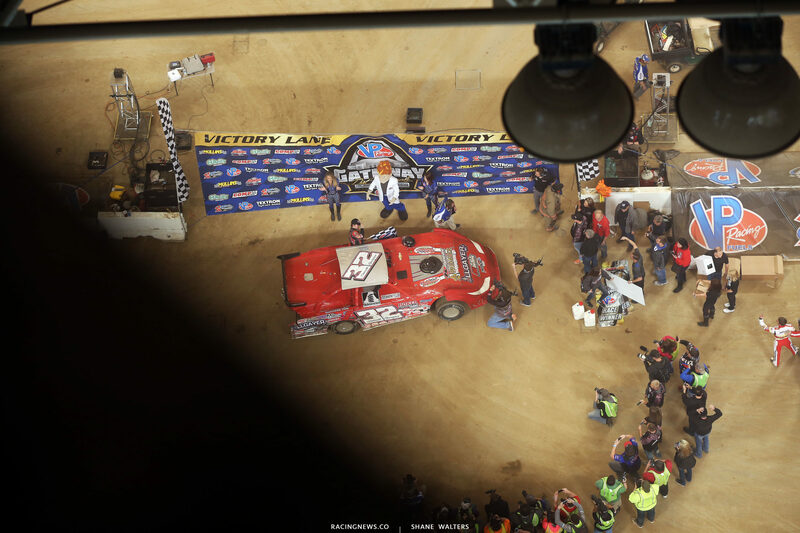 As Bobby Pierce pulled into victory lane, Terry and Tanner English joined the celebration. But, they weren’t there to celebrate. English walked over to Cody Sommer, holding up two fingers. I was 300 feet above the scene, so I don’t know exactly what was said. But, holding up two fingers, I assume he was saying he led the last two laps. Tanner English was escorted out of victory lane. Did the officials make a mistake? No. Honestly, I thought they did and I came here to point it out. But, after a scan of the rulebook, I understand what happened. The +1 rule was the difference maker. Lap 28 (what if’s): Had English led lap 28, he would have restarted the race in the lead. He would have led them to green with just 12 laps remaining. The bump from Tyler Carpenter also cost English the lead off turn 4. Had that not happened, he would have led lap 28, as he only lost the lead at the line by 12 inches. Lap 29 (what if’s): Had the caution come out literally .1 seconds later, Bobby Pierce would have crossed the start finish line. That would have made lap 29 a compete lap. This also would have placed English at the front of the field. Instead, the caution came out after English crossed the start finish line and before Pierce crossed the line. They had a full car length between them. In that situation, they revert to the previous lap because two cars need to cross the start finish line to make the lap official. They made the right call and it was a great race. A.) All races are scored at the designated start/finish line. B.) 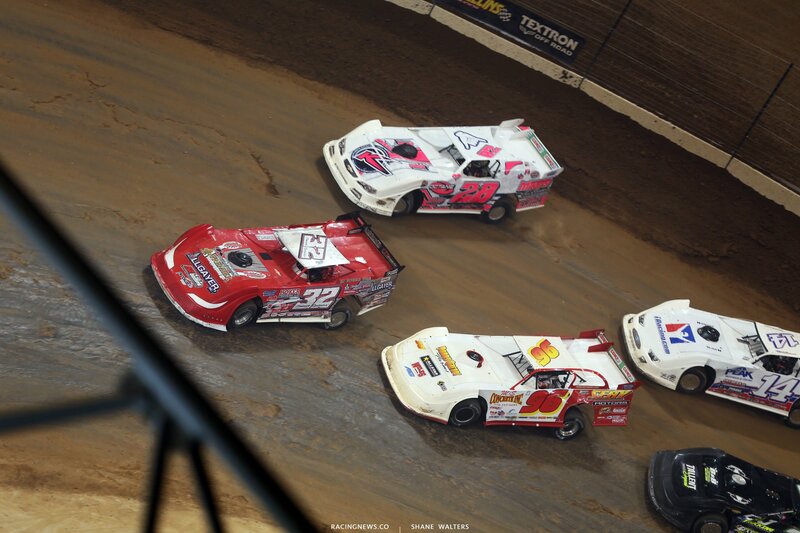 The original starting lineup will be posted by Gateway Dirt Officials after the completion of all qualifying events. C.) The restart lineups will be derived from the official scorer’s lap and line scored sheets. In the event that there is a discrepancy in scoring to reset any lineup position scoring will revert to the last completed green flag lap to derive the lineup. D.) After the first completed green flag lap, when the caution is displayed all cars that were scored under green flag conditions will hold that scored position with all other cars lining up according to their last completed green flag scored lap. This partial lap will count toward the event’s total number of laps. Racing back to the start/finish line will not be permitted and in the event that there is an on track scoring dispute, the chief scorer will refer to the last completed green flag lap to resolve the dispute. E.) A lap will not be scored on the original start and/or any restart unless leader +1 cars complete the lap by passing through the start/finish line except for the cars involved in the incident.